One of the many things in Aberlady which has endured, is the village's association with football. There has been a team of one sort or another here for many years ( with a few breaks ). We at aberlady.net are always on the lookout for any information on any Aberlady team which ever existed as we know very little about them. What we do know is detailed below. If you have information relating to football in Aberlady please Contact Us. The earliest record we could find of a game involving an Aberlady football team is a friendly game they played on 24th November 1877 against a team called Thistle. It was a home game which Aberlady lost 0-3. The next mention is of an away game on 5th January 1878 against Swifts. They inflicted an enphatic 5-0 defeat on Aberlady. 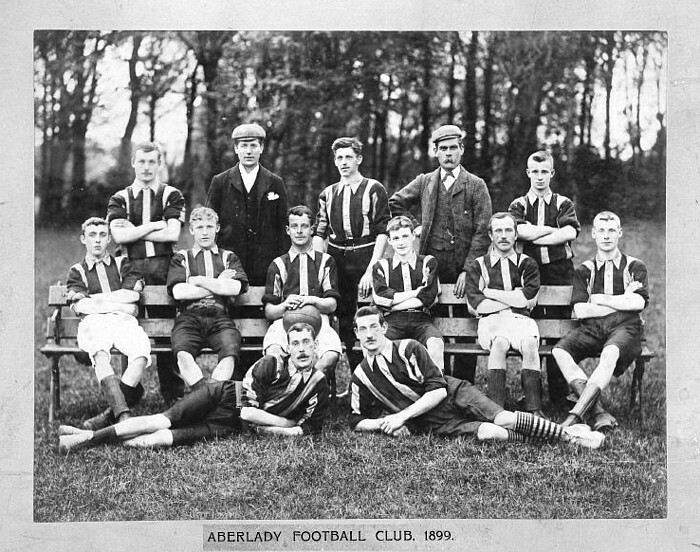 Around this time Aberlady also played friendlies against teams such as Beltonford, Waverley and Bellevue. The last record we have of them playing as Aberlady is a friendly ( home ) against Haddington Thistle which they drew 1-1. Aberlady is mentioned on Clublist as having played as Seniors between 1877-1882 and Junior between 1888-1889. 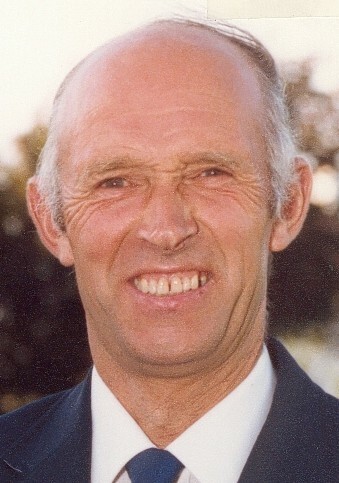 "Jimmy Sangster took over the team in 1960 and he started from scratch. Freddy Burnett was the Trainer. The team colours were: Blue Jersey with yellow sleeves. For the next four years it was a superb team. I played juvenile football until 21 years old then played at Dirleton before joining Aberlady. We trained twice a week ( Tuesday & Thursday ) at the football pitch and also in the community hall. We changed for games upstairs in the Wagon Inn - it used to be situated opposite the Kilspindie Hotel - until the present pavilion was built around 1962. The team played in the Lothian League ( East Section ) alongside such teams as: Pencaitland, Pathhead, East Linton, Tranent, Drummohr etc. At that time Pencaitland lost in the final of the Scottish ( Amateur ) Cup at Hampden then again the following year at Powderhall ( by Queen's Park who had Eddie Turnbull as their manager - he would later become Manager of Hibernian FC ). That showed the quality of the league. I was the only local in the Aberlady team. There were a few others in the pool such as: John McHugh ( Prestonpans ), Alec Ferguson ( Musselburgh ) and Tommy Dolan. It wasn't a big pool and Jimmy mainly stuck with the same players". There was of course no substitutes in those days. "Jimmy arranged a few friendlies, the first one against Broughton from the Borders where we had a good win. Then it was onto league business. The team always did well. The highest position reached in the league was about 2nd. Pathhead and Pencaitland were the really stand out teams. Aberlady also did well in local cups. The best performance was one year in the Scottish ( Amateur ) Cup which had about 800 entries. Aberlady reached the last 8. A fantastic run. In the first round we played Tranent Amateurs at Aberlady. A really hard game which we won 2-0. Then a tie against Postal United at Muirhouse, Edinburgh, a 1-1 draw. We won the replay at Aberlady 2-0. Then we played East Linton at home and won 3-2. ( games up to this point were played Regionally, Lothians and Edinburgh ). We went across to Fife for the next game at a place called Kinglassie. A terrible day, dark, pouring rain, Played on a sloping pitch. Water running down it. Tommy Murray scored an own goal past me. We equalised late in the second half. The referee abandoned the game with ten minutes to go. We Had to go back the next week and we "slaughtered" them 4-1. Colville steelworks ( Motherwell ) were the next opponents, at Motherwell. It was another winter's day and Aberlady got a 1-1 draw thanks to a late equaliser by Dodd Anderson. The following Saturday the replay was played at Aberlady in front of a huge crowd, "somebody said there was 600 people there" - remember Aberlady was much smaller then. We won the game 3-1. Then we played against P O Phones ( Glasgow ) who had an amateur international centre forward. I was injured in the first half ( knocked out going for a high ball ). The team Lost three goals while i was off the park. We lost the game 5-1. But it was a terrific run". That particular team ( under Jimmy Sangster ) lasted about four years until he packed it in. The team folded soon after. Some of the players wanted to play in a different ( higher? ) league which would have meant a lot more travelling and expense. While others didn't and as a result Aberlady lost a few players". At the time of the interview at least two of the above team had died: Gilbert Herris and John Connaghan who played at Outside Right. We would like to thank Jock Brodie for much of the above information.